Mother Jones: Is contemporary photojournalism more about daredevilry and showmanship than nuanced storytelling? Fred Ritchin: In recent years the tendency has been to elevate the messenger over the message, a strategy which effectively keeps their more painful imagery at a distance. 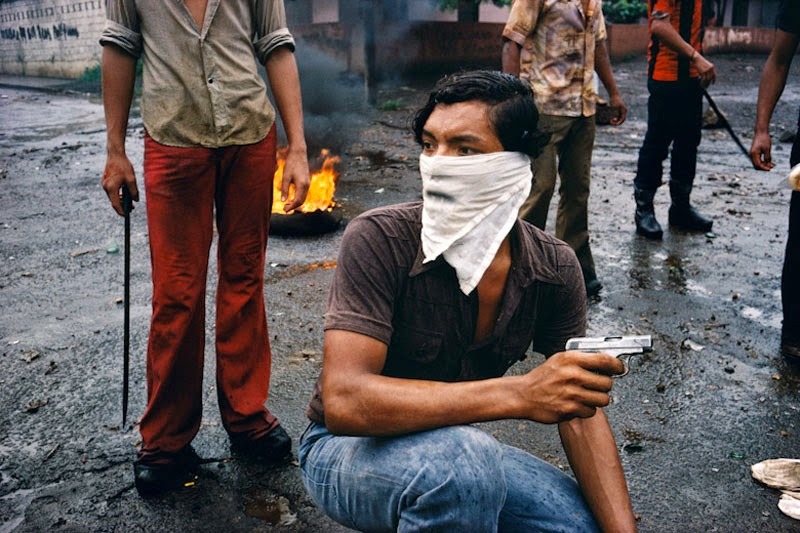 The courage of the photographer is celebrated while the circumstances of his or her subjects becomes somewhat secondary. As a result the photograph becomes less of a window onto the world and more of a mirror reflecting the distorted priorities of the culture consuming the imagery. The violence of war is not an unfamiliar subject for artists, providing the basis for countless works portraying symbolic and individual heroism or martyrdom. It was Francisco Goya’s Disasters of War (1810 – 20) that may have been the first Modern portrayal, and protest, against war, its atrocities, and the parties that perpetuate it. Disseminated widely as intaglio prints, the body of work makes no celebration of causes and despairingly, at times even angrily, depicts the boundless human suffering he witnessed in Spain during the Peninsular War of 1808-1814 . 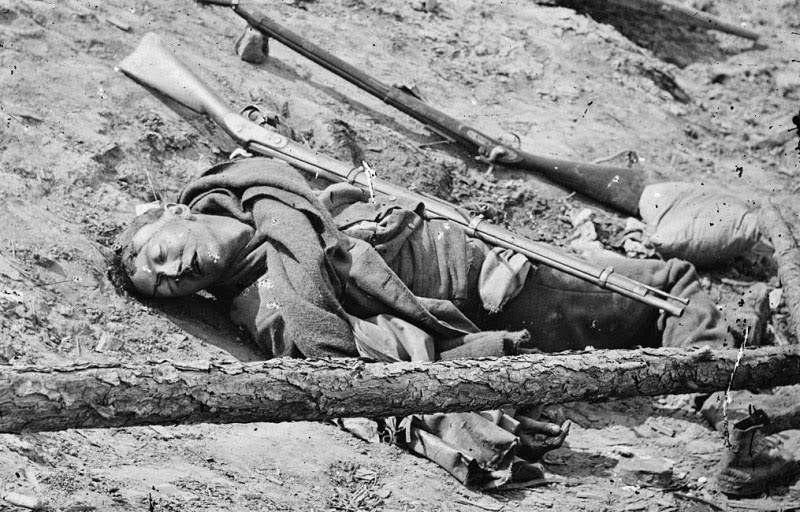 In the mid-eighteenth century Roger Fenton, followed shortly thereafter by Mathew Brady and his team, were the first to photographically document war. Ever. Their bodies of work, evidence of the Crimean and American Civil Wars respectively, were in stark contrast to the heroic war painting known to centuries past. They portrayed, almost uniquely, two types of images: the portraiture of soldiers, officers, politicians, and the grim post-battle landscape. However, contrary to what James Merrigan suggests in his review of The Enclavein Billion #70 (2), this was not done out of any stylistic concerns or pretense; this was not Romanticism. Instead, they were both limited to what the technology of early photography allowed. That is, the exposure times needed to capture the latent image on a glass plate with a large format camera, which were far longer than we are accustom to today. Thus precluding photographing anything in motion; any action. Leaving only the margins; the still and stayed images of bodies, either posed in full regalia or decomposed in a trench. 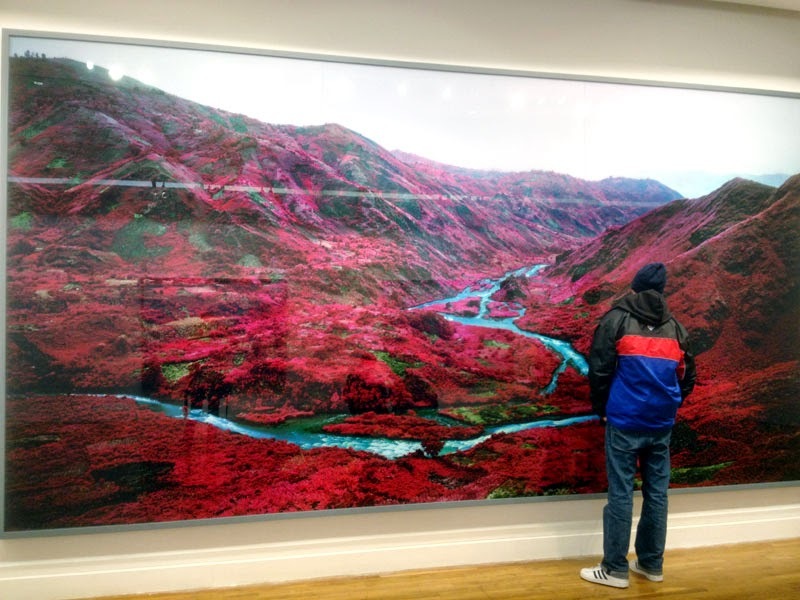 Richard Mosse too is affected by the influence of technology, although consciously, and anachronistically, straddling the line between the documentary and the artistic. Mosse has travelled to the Congo on a few occasions in the last years, first completing Infraand then his Venice commission for the Irish Pavilion, The Enclave. In both he used infrared film to produce still images and, in the latter, videos transferred from 16mm film. Infrared film scientifically captures light waves human eyes cannot detect, and reveals it as pink. Easily processed in standard slide film chemistry, it has been frequently noted by Mosse and others that there was an inherent connection to armed conflict because infrared film was ‘developed’ for military purposes. It is a not so inspiringfact that infrared film has been around for 70 years and its use, by and large, is exclusively for a very mundane practical sort of work. Vegetation changes in the Tennessee River valley are not front page news or art. In a video interview Mosse also acknowledges the Psychedelic movement’s gimmicky use of Infrared as the beginning of its more contemporary unfashionable-ness in photo/art circles. Ok, so let’s look at the facts; the RHA exhibition. After passing through a gallery with some of the largest mounted on glass landscape photographs I have ever seen, we enter a second darkened gallery with 6 screens. 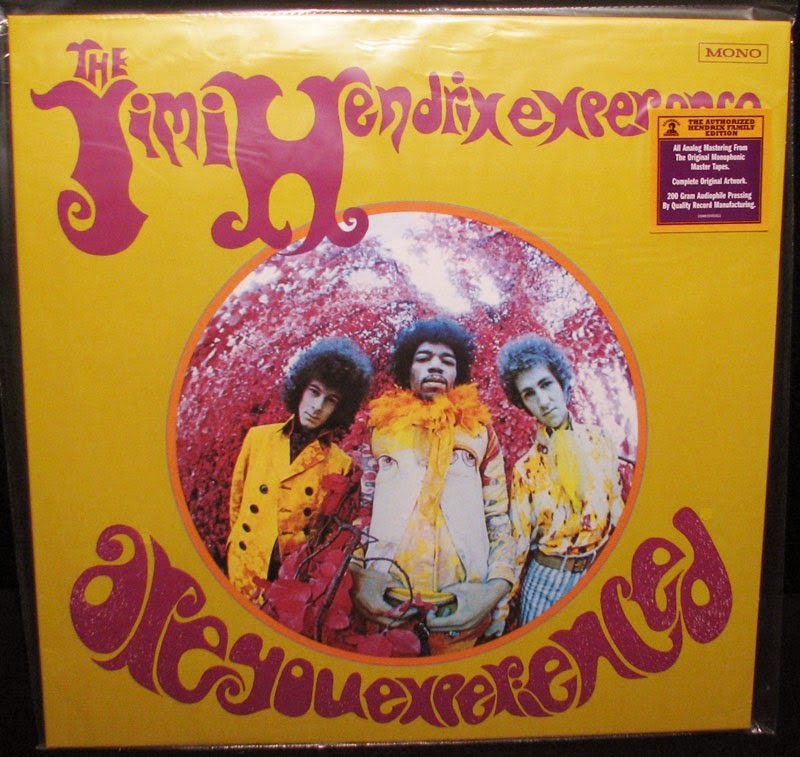 The audience is shown 30 minutes of ultraviolet film footage edited into a non-linear montage. There is a discordant soundscape overlaid throughout. In everything, green is magenta. 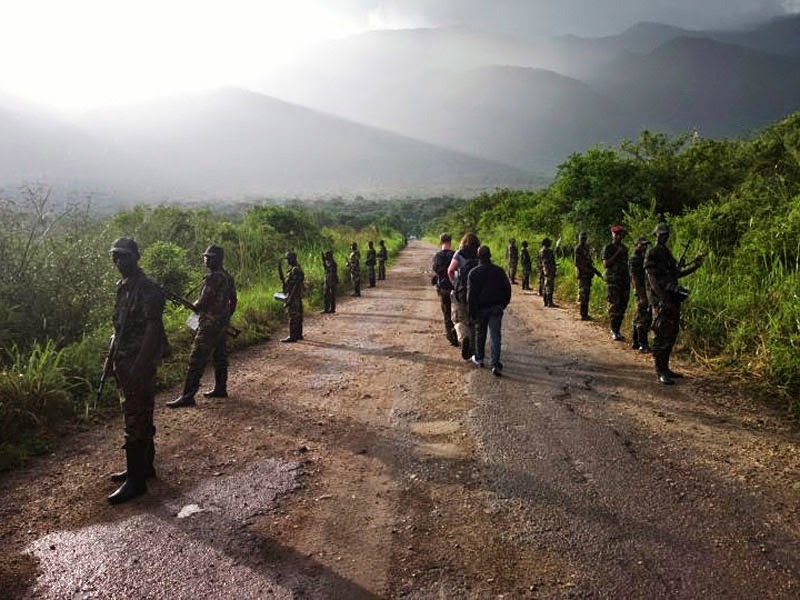 The footage was shot recently in the Democratic Republic of the Congo, a region that has endured a series of brutal dispersed wars, genocides, massacres in the last 20 years. The subject of the footage itself is varied, showing soldiers in a variety of activities, a funeral, crowds, a community celebration, a refugee camp, the landscape, a birth… (please see Adrian Duncan’s review in Paper Visual Art for an insightful read on this). Cumulatively, this makes up the installation and the artist will have it that all this is to be seen in rethinking and examining the “hidden aspects” of a series of wars and massacres. Relying solely on this conceit, Mosse, rather than framing his subject matter in such a way that we see another layer, or creating a project with a structural shift away from the norms of documentary film, falls back on a rather unrigorous methodology. Unfortunately this revealing of the unseen exists as scientific fact in the film itself, but only symbolically in the meaning of the installation. I doubt very much this work has revealed hidden layers of the conflict to anyone. The photographic effect is eye candy – novelty (pink trees can also mean that it is perfectly alien, in not such a metaphorical way). The conceptual premise Mosse has put forward remains singularly an extended, unarticulated, superficial and purely symbolic visual metaphor. It has no connection beyond this symbolism to any greater idea; to anything bigger than the author. And because of this, the way of seeing and presentation is determined by the author’s intuition entirely. It is absolutely subjective, as there is no guiding principle. Any point, any attempt at uncovering the unseen is a construct imposed by Mosse and his team. 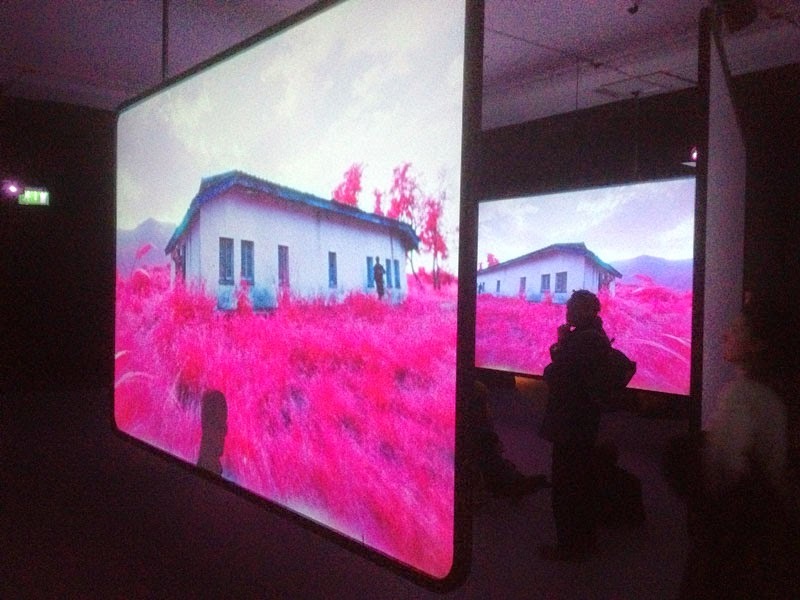 Further, the show’s immersive installation blankets the issues of the Congo in another layer of ethical problematics. Jumbled screens provide repetitious footage visible from both sides, leaving an impression of broken shards of mirrors reflecting. 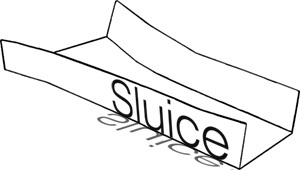 It is fragmentary – cubist and symmetric. The audience is unable to see the whole picture, the entirety. De facto, this is Mosse proposing to the audience that there is no singular fixed way of seeing this war, or war at all. 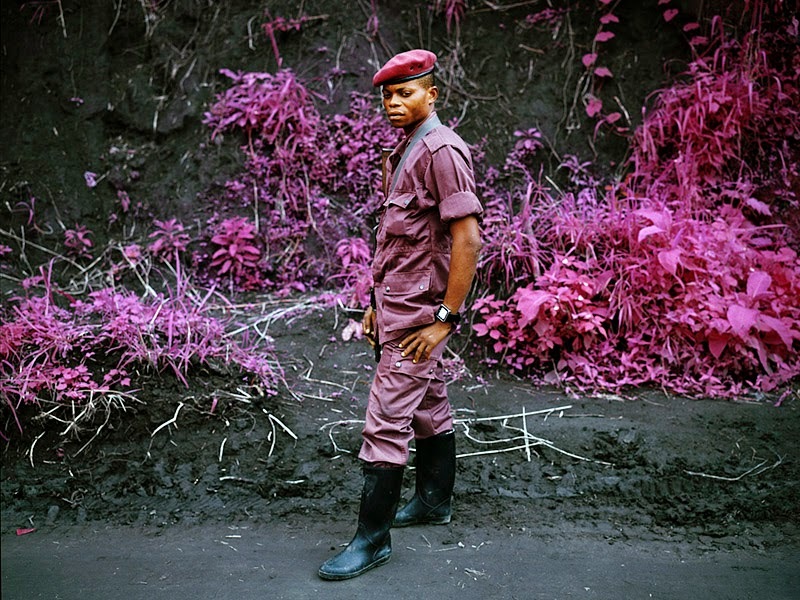 That military conflict fragments one’s perspective; that it is chaotic in the Congo. And fair enough. 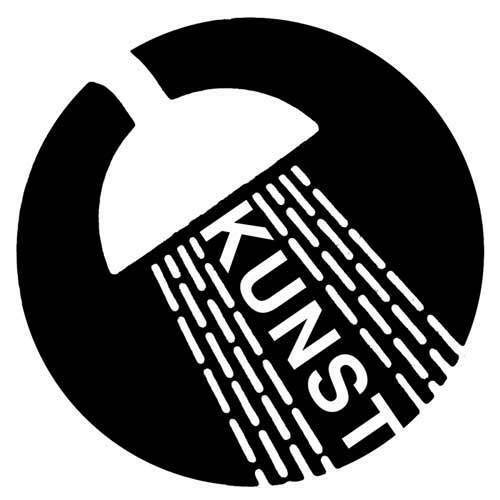 But confusion is the lasting message: a physical embodiment of the artists’ sentiments. By not creating a system of interaction based on a critique of, or the inversion of, the author/subject relationship (and by extension then, utilising one that is only guided by the author’s needs), Mosse appears to be embarking on a kind of extreme tourism or consumerism. Besides tourism, another similarity of The Enclave might be to a human zoo. 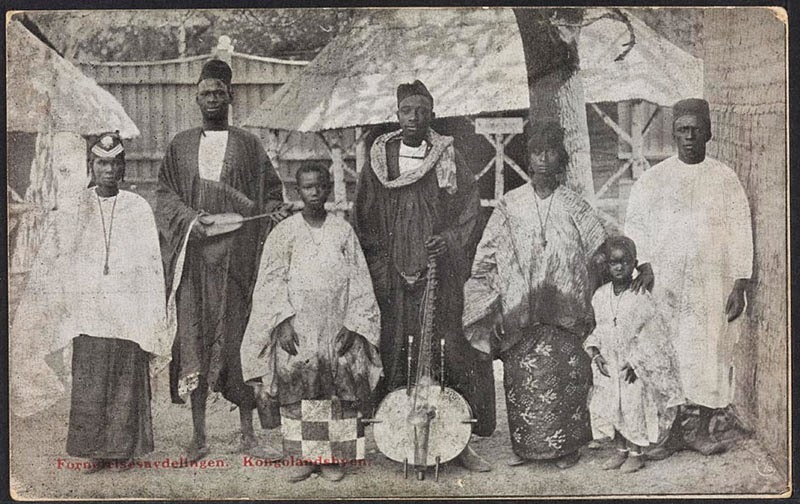 Not as flip as it might initially seem as it turns out… In 1914 there was Kongolandshyen, a Congolese human zoo in Norway. A village of around 80 was recreated for the country’s centennial Jubilee Exhibition and was on public view for 6 months. Apparently contention, muffled racism, and an arrogant pseudoscientific wonderment, what I would regard as responses typical of that time, were generated in Norway by this exotic display (7). Dressed and housed in native trappings, this confinement becomes performative. This ‘village’ provided a form of entertainment based largely on preconceived and culturally constructed notions in Europe of Africa, Black, Other. Certainly exhibiting ‘other’ people confined and on view to the public only reinforces stereotypes, not enhancing any real knowledge of their lives, or of them as people. From an ethical point of view, does The Enclave contribute anything but stereotypical portrayals of Africa to the West? What is The Enclave? What is its objective? It was made for a major art exhibition. It is an interpretation from a non-expert, non-local. 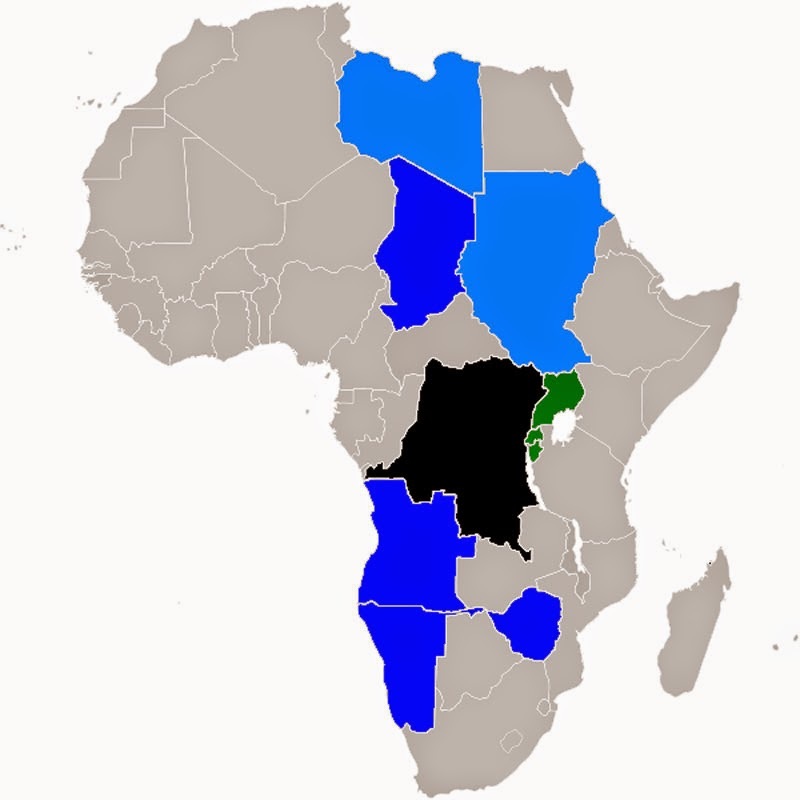 It adds little to the knowledge of the region nor convey the experience, lives, thoughts… dreams of the Congolese. On the contrary, Mosse is embedded with a militia. Throughout the work it is unclear whose side we are standing on. I accept that this may be a conscious decision as well. But these military figures appear to be acting, carrying out exercises for Mosse’s team. Can we speculate that these uniformed men were paid, bribed, given gifts? Meaning and ethics alike become masked and impenetrable with the combined experience and understanding of the filming, installation, technology, point of view, and interaction. The Enclave is not a documentary nor is it for promoting knowledge. Interestingly, a number of photo-documentary projects have taken place in the Congo in recent years that address these concerns. 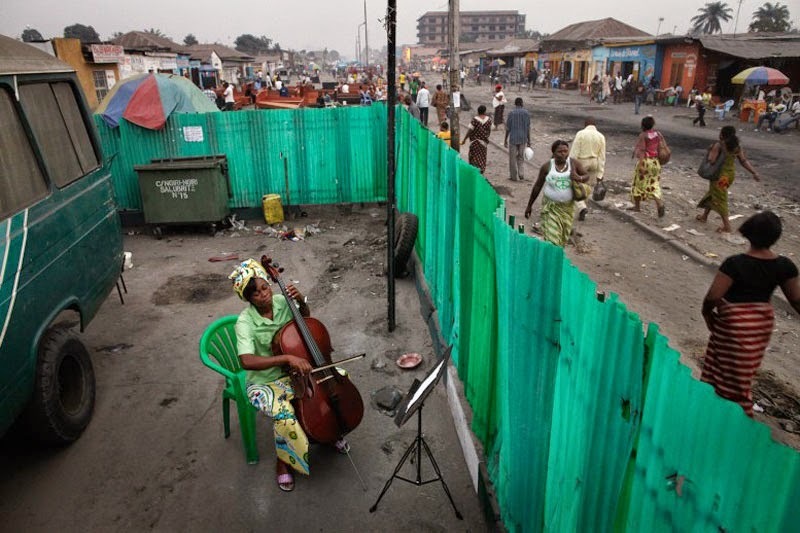 The likes of Irish photographer Andrew McConnell’s Joséphine Nsimba Mpongo, 37, practices the cello in the Kimbanguiste neighborhood of Kinshasa, Democratic Republic of Congo summarises a unique, subtle, and humanising approach to documenting people’s lives there. The Living Unnoticedseries by Jana Ašenbrennerová is another example. In a way it is understandable for Mosse not to repeat the style of these works in trajectory or methodology. He is making art after all, not journalism. Likewise, I appreciated Mosse’s original Infra series. The early traditions of war photography, both landscape and portraiture, were realigned to be reassessed through an applied use of infrared film. A different and succinct body work. I liked that it drew me into the subject. The inverted colour spectrum momentarily pushes away the visual cliches and the semiotics of ‘soldier’ or ‘war’. Naysayers seemed to think it was gimmicky, commercial, a one liner. I also wouldn’t disagree, and I still like it. But the artist’s direct way of seeing in Infra,gives way to an ultimately meaninglessly complex presentation of visual montage in The Enclave. We see the Congo through the lens of a frenzied onlooker, capturing snippets of everyday life and set-up shots with paramilitaries. Multiple screens angled to each other, overlapping, not presenting any one view, and repeating haphazardly. All lending itself to obvious sculptural, physical, experiential metaphors. The sound engineering adds a menacing, tense drama to the installation while overwhelming the real sounds taking place while filming. Is this not an experiment in Hollywood’s emotive techniques? Experience the drama, but what of the actual content? But what of the structure of engagement? Indigenous people brought to a western theatre for fractured observation – The Enclave is disempowering for the subject. It has major ethical problems. While I disagree that any criticism to an artwork on view to the public could ever be unsolicited, I think he raises an interesting consideration: that of the inner-circle (artists, curators, students, writers) and public split. I would however use this thought inversely: we cannot gauge art by its ‘ticket sales’. Euphemistically speaking, Mosse’s The Enclave is a box office hit, but is getting the thumbs down from the critics. It is with reason that I find this comparison to Hollywood apt. Mosse employed the slick, (and familiar) professional techniques of mainstream cinema and advertising, with surround sound and jarring, repetitious imagery accentuating the transformed candy-like appearance of the leading role: the landscape. Unfortunately, the Congolese play themselves as extras without speaking parts. Regrettably, there are no easy answers to the countless considerations in creating exemplary lens-based work in ‘conflict regions’. Mosse documented rebel enclaves and sites of human rights violations in a way which attempts to overturn traditional realism, and see beneath the surface. But this only takes place in a symbolic way, not in a real way. It is the unfulfilled potential of this possibly empowering project that is The Enclave’s biggest failing. The spectacle of a technological trick foregrounds the concept, and the Congolese. Ultimately what is Mosse trying to say? What I was left with was a prevailing sense of an unethical sensationalism. Jim Ricks is an artist based in Dublin. He recently toured Afghanistan with the collaborative project In Search of the Truth. (8) p. 95, Regarding the Pain of Others, Susan Sontag, 2003, Picador, New York. Agree there’s no sense of a voice here, but it gives the illusion of there being a voice, you see Africa, guns, colours, and you think “ah this is something terribly profound,” but you look for the manifestation of that profundity, that insight and it’s just not there, by not having a voice, a point of view, you project what you want to project onto it. I don’t want what I know or assume confirmed when I see something like this, I want them tested, challenged and provoked. Agree also that the ifra red is essentially a gimmick. I once read about this photographer who was traveling around Asia and he wanted to take some photographs of this guy selling bananas on the side of the road, so he asks him for permission and the seller says “no, you just want to take this picture home and show it to your western friends and tell a story about how poor we all are here, you want to make my suffering something pretty to put on your wall.” And that’s what I see the Enclave as, only it’s worse because an art gallery is never a neutral space (and that goes double for race Bourdieu in The Love of Art shows how people of lower income and racial minorities spend 20-25% less time in art spaces), it’s an extremely privileged one, and with that privilege artists have an ethical duty to thread carefully and deeply, to somehow acknowledge that privilege, that platform and not just through that tiresome conceptual safety valve of making art about art. You read Rudyard Kipling’s stories about India, you get the beauty, you get the weirdness, you get phrases like “white man’s burden”, so you see where he’s coming from, you hear his voice, it’s not always pretty, but he tells you what he thinks and who he is and because he does that, it gives you the respect and freedom to make up your own mind. ‘The Enclave’ might think it’s giving the viewer credit to make up their own mind (about what? ), but in reality what it’s doing is not trusting to you enough to have the intelligence and fortitude not get offended, if this art was any safer they’d be handing out crash helmets at the entrance. One of the best, if not the best show I ever saw in Ireland was William Ketteridge in 2006 (I think), here the subject matter was similar, you had instead of the Congo, South Africa, that show worked because it was charcoal animations, because you saw his point of view, in how he drew, his tenderness in the etchings his hand made on paper. The show’s theme was tragedy, it was loss, it spoke of things deeper than just South Africa, through South Africa and because it spoke of things deeper than South Africa you felt you were being told something about South Africa through that deepness. In William Ketteridge you saw a truth, in ‘the enclave’ you see the lies you tell yourself. ‘The enclave’ is a piece of set design, wonderfully executed technically, the layout, the photography, the sound design, all 100% marvelous (quite liked the fragmented temporalities), as good as anything I’ve seen in Ireland and anything I saw in Venice, but totally devoid of meaning, there’s (to borrow a line from Dickens) a cavity in the place where its heart should be.